Throughout the past three and a half years, I’ve had the opportunity to see and hear some of Black America’s top leaders and thinkers as a student at Howard University. In fact, this past weekend, the Institute of the Black World held hosted its State of the Black World Conference on campus. On a smaller scale, professors have brought some movers and shakers to their individual classrooms to influence, inform and inspire their students. My entrepreneurship professor tapped into her network, and invited a few Black entrepreneurs and representatives from business-related organizations to speak with us about business planning and ownership. We’ve had Ron Busby, the president of the U.S. Black Chamber of Commerce; Michael Grant, president of the National Bankers Association, a representative from the Small Business Administration and two bankers from Wells Fargo (I have mixed feelings towards Wells Fargo). Last week, our guest speaker was Omarosa from The Apprentice, but our last and best speaker was author, activist, speaker and educator James Clingman. James E. Clingman is the nation’s most prolific writer on economic empowerment for Black people. His weekly syndicated newspaper column, Blackonomics, is featured in hundreds of newspapers, magazines, and newsletters (My professor Hazel Trice Edney is the owner of Trice Edney Newswire, one of the many outlets that carries Climgman’s column). He has written six books, the latest of which is Black Empowerment with an Attitude, and has been the featured speaker for numerous organizations, schools, churches, and events across the United States. Former Editor of the Cincinnati Herald Newspaper, Clingman is the founder of the Greater Cincinnati African American Chamber of Commerce…He is an Adjunct Professor at the University of Cincinnati, where he teaches Black Entrepreneurship; he also founded Cincinnati, Ohio’s Entrepreneurship High School in 2001. Clingman has received many awards for his journalistic work, including the prestigious Black Press of America’s 2008 Black Press Champion Award, from the National Newspaper Publishers Association and Foundation. Clingman’s presentation to our class was more motivational than technical in nature as it related to Black entrepreneurship. I left class that day with many jewels, but I’ll share a few points of valuable information that everyone needs to hear and can use. 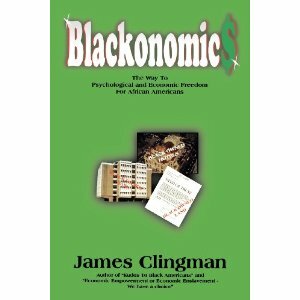 Blackonomics is a term Clingman coined in 1998, and it stresses the importance of Blacks being a part of the economy. He urges us to be active in the system by getting back “the semblance of owning and controlling” businesses as well as demanding market reciprocity from the businesses that we support. Three questions framed Clingman’s discussion of Black Entrepreneurship: What? So What? And Now what? Clingman gave us some alarming statistics about entrepreneurship and economics. He told us less than 5% of entrepreneurs are African American, and the net worth of White families is 20 times that of Black families. These dismal statistics are a rallying cry for Africans in America to change the way they look at jobs and the economy and to shift from getting jobs to owning jobs. Clingman told us that we own jobs by starting and growing businesses. It’s not enough to merely start a business. You must grow the business to employee people. Statistics regarding Black economic empowerment are depressing, but why should we care when we can get a good education and a good job? Clingman calls Blacks to step out of the individualistic mentality and do something beyond their “own personal enrichment.” Either way, having a job doesn’t grant you true economic independence and empowerment. It provides income, but not wealth creation. According to Clingman, wealth is only created through investments, real estate and business ownership. Clingman also calls for Africans to demystify the myth of Black inferiority and to break the chains of psychological slavery. We have been made to believe we don’t have the acclivity and inclination to own businesses,” Clingman said. “This myth has been allowed to permeate so deeply, because we don’t know our history. History reveals that Black people were successful business owners and had an entrepreneurial spirit even before arriving in the United States. Clingman cleverly stated, “We didn’t come to America on slave ships. We came here on entrepreneur ships.” The entrepreneurship professor finds it necessary to teach Black business history before anything else, so his students may know where they’ve came from. Jews support Jews, Germans support Germans; Italians support Italians until they get strong enough to compete with their brother in the professions and trades; Negroes should now begin to support Negroes. We’ve bought everything everyone else has made, but we don’t buy our own products. A part of taking action is transforming our Black neighborhoods into Black communities, which are virtually nonexistent. Clingman identified the three necessary components that make up Black communities. We control the economic environment through ownership. The bottom line of Black entrepreneurship is that owning and controlling businesses is one of the most important things we can do with our lives for our own likelihoods and for the betterment of people as a whole. We must regain our economic communities, discredit the myth of Black inferiority by learning our history, break the chains of mental slavery, and strive towards true economic empowerment.